You don’t want to miss this Slow Cooker Eggplant Parmesan. It will have everyone thinking you spent all day in the kitchen. Cheesy and delicious with a fraction of the effort. Perfect for easy entertaining! I’ve used gluten free breadcrumbs, but if your family isn’t gluten free any breadcrumbs will work! Or skip the breadcrumbs altogether for a lower carb alternative! 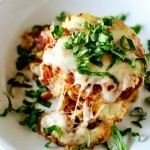 This Crock Pot Eggplant Parmesan is pure comfort food! One of my husband’s favorite dishes is Eggplant Parmesan. That he loves Eggplant Parm so much is surprising because he is a total meat guy. Typically, I make it only four or five times a year, because…it’s a process. One that I don’t particularly enjoy. My traditional recipe requires either baking or frying the eggplant before it goes into the casserole. There are few things that I hate more than standing over a hot stove frying. 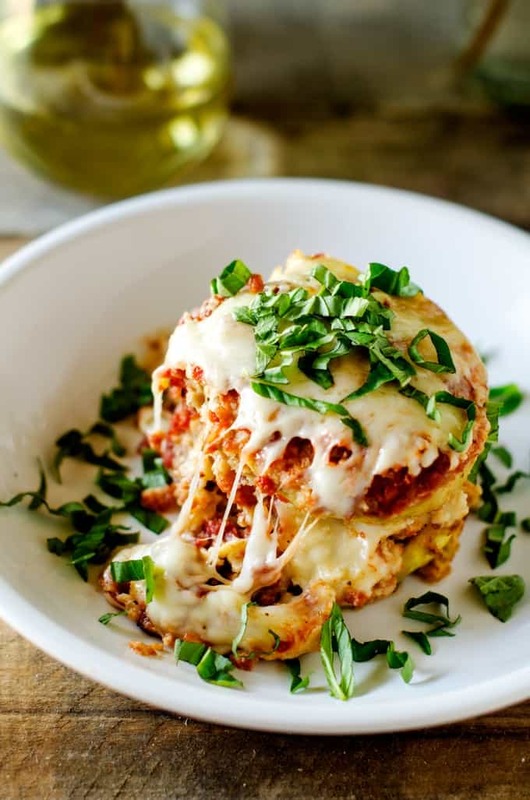 I adore my slow cooker, so a few weeks ago when he asked for it, I started thinking – would it be possible to make Eggplant Parm that resembled my traditional dish in my slow cooker? Was it even possible that Slow Cooker Eggplant Parmesan could taste anything like the original? I wasn’t entirely convinced it would work, but when organic eggplant went on sale, I decided to give it a try. Actually, didn’t even mention that I was trying it to hubby because I wasn’t 100% convinced that we weren’t going to be having tacos for dinner. 1 I am thrilled to report that it was a smashing success. 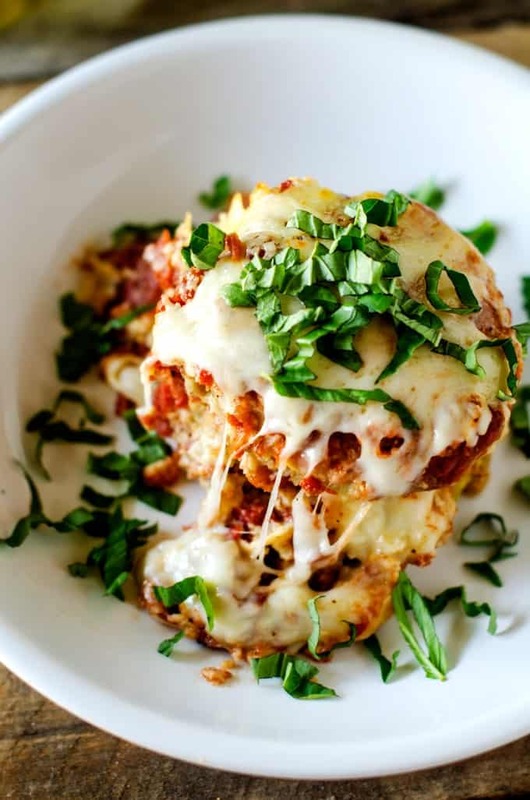 3.1 If you like this Slow Cooker Eggplant Parmesan, you may want to check out these other slow cooker recipes! I am thrilled to report that it was a smashing success. This is perfect for the occasions when you are called to entertain and need a dish that just looks and tastes like you spent all day in the kitchen. Do Not Skip Salting the Eggplant! Time needed: 8 hours and 25 minutes. Peel your eggplant and cut into 1/3 inch rounds. Layer in a colander, sprinkling each layer with salt. Allow to sit for 30 minutes. Pat dry. If you are watching sodium or dislike salt, you can rinse and then pat dry. Put 1/2 cup of sauce in the bottom of your slow cooker. In a separate bowl, stir together breadcrumbs, Parmesan cheese, and Italian seasoning. Dip eggplant in the egg mixture, and then in the breadcrumbs. Layer 1/3 of the slices in the slow cooker. Top with 1 cup of sauce and mozzarella cheese. Why is it necessary to salt the eggplant? Salting eggplant pulls the moisture out of it and prevents the dish from being runny. Even if you don’t like salt, don’t skip this step! Can I fry the eggplant and finish in the slow cooker? Yes, by all means! If you have the time you can cook the eggplant by frying or in your Air Fryer. Reduce the cooking time to 2-4 hours. 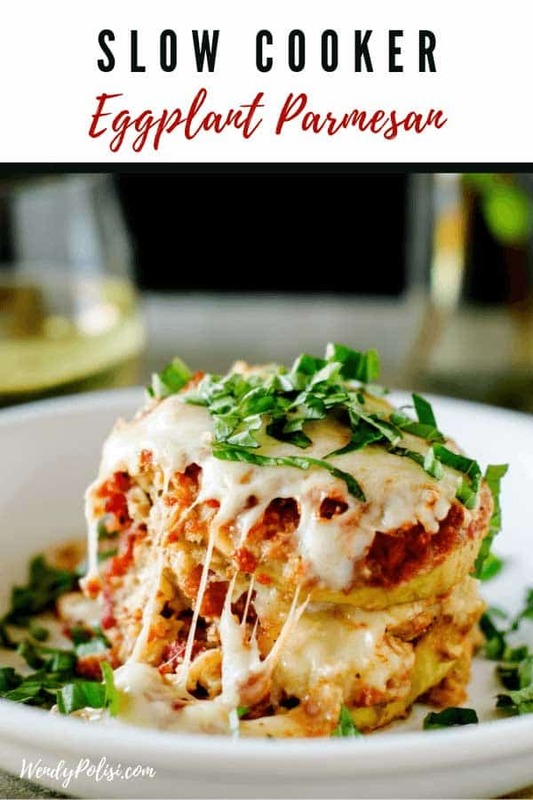 If you like this Slow Cooker Eggplant Parmesan, you may want to check out these other slow cooker recipes! This Gluten Free Slow Cooker Eggplant Parmesan will have everyone thinking you spent all day in the kitchen. Perfect for easy entertaining! Spread 1/2 cup of sauce in the bottom of the slow cooker. Whisk together the eggs and milk in a shallow bowl. Stir together breadcrumbs, Parmesan cheese and Italian seasoning in a separate bowl. Dip eggplant in egg mixture and then in the breadcrumbs. Layer 1/3 of the slices in the slow cooker. Top with 1 cup sauce and mozzarella cheese. Repeat layers two more times. Cook on low for eight hours. If desired, top with fresh basil leaves. Becky, it is normal rounds! This is one of my husband’s favs as well – can’t wait to try it! 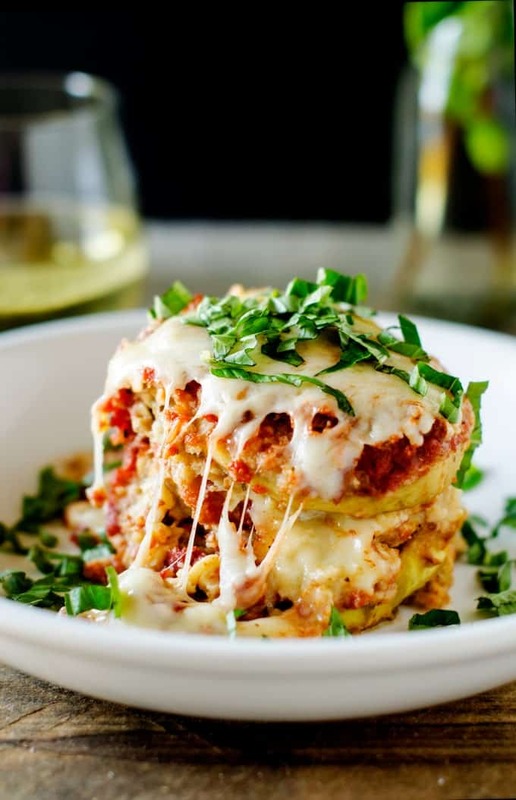 Just a side note – it’s a good idea NEVER to fry eggplant – it’s super absorbent & soaks up tons of oil which is why traditional eggplant parmesan is SO high in calories! This sounds great! I love eggplant Rollatini, thinking of adding a dollop of ricotta (mixed with an egg, chopped spinach and dash nutmeg) on top of each layer of eggplant before the sauce and mozzarella…….do you think this would work? How many servings does this make? 4 pounds of eggplant seems like a lot. I don’t know that I calculated nutritional information on this. I would say it is somewhere between 8-12 servings. It is definitely a crockpot full! Do you think this would work if cooked on high for 3-4 hours? Great recipe idea, btw! what size crock pot do u use? I have a 7 quart crockpot. Yes, it isn’t as crispy as some but I totally loved it! So glad that you enjoyed it. Moussaka is such a great idea – let me know how it goes. I made this last night and was short on time, so I did High for 4 hours – it was good, but some of the cheese got tough – I think I could’ve gotten better results with High for 3 hours, or low for 5 (my slow cooker runs a bit hot). Also I skipped the breadcrumbs altogether and it was still delish! But my favorite Eggplant Parm is always un-breaded, so it might not be for everyone! Have you ever prepared the Eggplant the night before? Do you think/know if it would keep? I salted the eggplant the night before and then rinsed them and stored in ziplock bag to assemble the next day. I ended up cooking it on high for 4 hours, turned out great. Hi Wendy! I was wondering if leftovers would keep well? Yes they do! My husband loves leftover Eggplant Parmesan. Just curious — what is the point of breading the eggplant if you’re not going to fry (or bake) to develop a crust on the outside? Doesn’t the breading just turn to mush in the crockpot? Why not just put the eggplant in the slow cooker without breading it? Can you substitute anything for the eggs or leave them out entirely? Mine turned to mush ☹️. I totally forgot step one, does itbreally make that big of difference? Just curious. Still tasted good, but it was soggy. Yes – step #1 is crucial because it pulls the liquid out of the eggplant and helps to keep it from getting mushy. Also, your slow cooker could be hotter than mine so you may need to adjust the cooking time. Hi! Trying to halve the recipe since the serving size is too much for my 2-person household, lol! Would it work if I just cut everything in half or are there certain things that need more/less? Also we are vegan so will be trying with egg replacer with hopes it’ll turn out good. How many eggplants did you use? Or, how many eggplants is 4 pounds? It obviously depends on the size but I used three medium. This sounds delicious & I’m going to make the eggplant this week! Do you think leaving the skin on the eggplant would change the recipe in any way? This looks delicious & I’m going to make it this week! Would leaving the skin on change the recipe at all? I have never tried it that way! But if you have made Eggplant Parm before and liked it with the skin on, I don’t think it would make a big difference.